In your first pile, put everything that you use on a daily basis. In your second pile, put everything that you have used, and think you will use soon. This includes off-season makeup, crazy lipsticks, and large eye pallets. In your third pile, put the makeup that you want to keep, but only use on rare occasions. Now in your last pile, you need to put the things that you don't want anymore. This includes makeup that you have never used, expired makeup, and makeup that you will never use again. Step 2: Find a place for each pile. Your first pile needs to be accessible. I would recommend getting a drawer organizer. This organizer needs to be the size of your drawer, and it needs to have many different little squares. You could also use a jewellery organizer! Step 3: Organize your first pile items. To do this, I separated them into eyes, lips, base, applicators, brushes, and skincare. I also put my everyday hairbrushes in the drawer. Step 4: Have you run out of room in your drawer? I did after putting all of my everyday items in. So, I had to find a good place for my second & third pile items. Luckily, I have a large cupboard next to my makeup table. The cupboard holds all of my second/third pile items, as well as my skincare, perfumes, and lotions. I tried to keep the makeup from my second pile in an easily accessible place. This way I can just reach down and grab whatever I need if I'm trying out a new look. Step 5: Now that most of your makeup is sorted, you need to find a home for the unwanted. 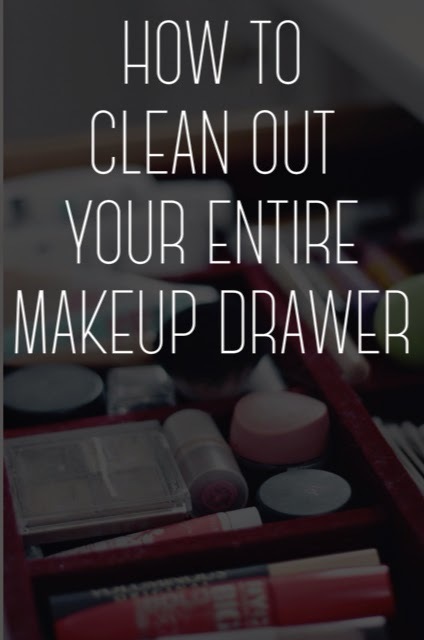 Before throwing away ALL of it, there are probably many people that would want your makeup! Give it away to your family and friends, but be sure to toss out your expired makeup. Done! I love the feeling of putting on makeup without having to shuffle through all of it just to find that one concealer. Happy cleaning!